So first I selected some of the fibre, and picked out the unwanted stuff - that would be anything you do NOT want in your end product. Yes Pixel, this means you. Cosmo, like many of my boys, manages to cover himself in whatever happens to be in his paddock at the moment - so this part kept me busy. In the mill entire fleeces are spread out on skirting screens and we can shake out dirt and little short bits etc., but since I was only dyeing about a pound of fibre, my kitchen worked fine. Be sure to tie the bag securely - fibre likes to escape. When the sink or tub is filled with hot water and whatever soap/detergent you are using, only then add your bag of fibre. Gently push it under the water and hold it there until the bag and fibre are soaked, then let it soak for 15 minutes. RESIST THE URGE TO SWISH OR SQUEEZE! Agitation of wet fibre causes felting. Really. Unless you want a solid clump of felted fibre that would make an ideal Halloween decoration, be careful! After 15 minutes, remove the fibre bag, drain the sink/tub and fill wit fresh hot water - no soap - for rinse. Repeat the above until the water you drain away is pretty clear. You can use the spin cycle of your washing machine for about 15 seconds to drain the excess water. Open the bag and spread on a towel to dry slightly before dyeing. Right about now is when I usually let my "Inner Space Geek" loose and declare (in my best Klingon voice) "TODAY IS A GOOD DAY TO DYE..."
That part is strictly optional. For the rest of you, fill a large pot with water and turn the burner on. At this point you should follow the instructions that come with your dye. Unless you are me. I'm going for a two toned effect with this fibre, so that means I'm going to start by adding about 3/4 cup of vinegar to the pot of water, then add my still damp fibre. I'll mix up my two colours, for this batch that would be Kelly Green and Turquoise, and put them into squirt bottles. When the fibre starts to boil (for those using a thermometer that would be about 95C or 200F - just before the true boiling point) I use the Kelly Green and squirt it directly onto the fibre in the pot while stirring with a spoon. I'll pick up globs of fibre and squirt them then put them back into the steaming pot. I do this until I am happy with the result, put a lid on it for 2 minutes, then turn the burner off and let it sit to cool off for about 20 mins. It's far prettier in real life. You can't really see the intense colour or the lustre here, but trust me, it is lovely. I was so inspired, I tried another batch. I started off with Sunflower yellow. Instant Spring! I can almost hear the steel drums and taste the fruity rum punch! Sometimes when life gets a little dreary and gray, you have to take matters into your own hands, and jump start things with a burst of colour. Drop me a line (dar@canadianalpacaproducts.com) and let me know your favourite way to add some colour to life. Even though things have been quiet on the CAP report during January, we've been very busy keeping the alpacas warm and healthy during the snowstorms and dry during the thaws of the month. I also had a nasty ear infection which kept me flat on my back for awhile. But there's lots to catch up on! We've been doing ultrasounds on our gals to monitor their pregnancy status and I am happy to say that we are expecting at least 6 new crias this year. Savannah's cria can be seen kicking her poor momma and she should be the first to deliver in June. We are also booking our shows for the year, and Canadian Alpaca Products is planning to be at the KW Knitter's fair, The Woodstock Fibre and Fleece show, and Port Elgin's Pumpkinfest later this year. Our first event will be our own open house on March 16th at Shears To You Fibre Pros. (See Upcoming Events for more info) I'll be busy dyeing yarns and making our exclusive Inca roving-yarn for the big day. Pantone has declared emerald green to be the colour for 2013, so I'm thinking I'll be using several different shades of green in our spring collection. Speaking of dyeing, I had 1 very special double skein of 70% alpaca 30% Tussah silk yarn, with no idea of what to do with it. One of the other vendors at the St. Jacobs Market is just learning to knit and we've been searching for an easy but interesting pattern for her first ever "real project". She was a little nervous about starting something, but felt inspired by the colours in one of my sock yarn skeins - but wanted a worsted weight. I remembered my alpaca/silk skein and brought the sock yarn skein home to use as a reference. I set about dyeing it and I think it turned out beautifully. The greens and blue make me think of a tropical sea - just the cure for the mid-winter blahs. She was thrilled with the skein and has already started the project, and even I am amazed at the lustre and softness of the yarn. Before I presented it to her I snapped a few photos, not the best due to lighting, but you can see the colours. I hope she'll let me take a picture of the finished project, and I'm so glad my yarn inspired her to pick up the needles! What kind of yarn inspires you? Sometimes even before the alpaca has been shorn, I can picture the kind of yarn the fibre will make - and what to do with it! Now that the holiday season is behind us, what kind of serious knitting/crochet projects are you working on? The next installment will be about our very special Inca yarn - with photos of how we turn average roving into amazing yarn using a kettle and some dye. Check back soon! Nuno that is. 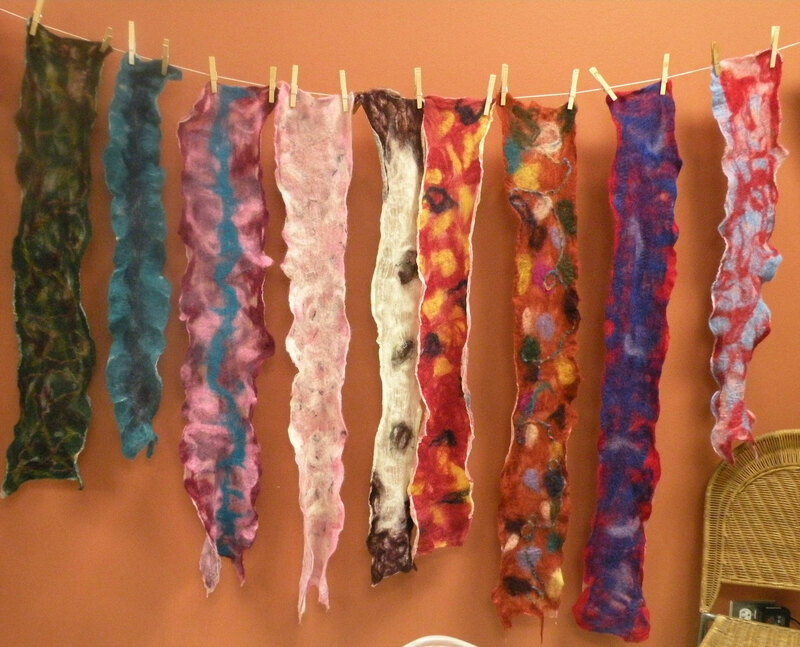 Nuno felting is a method of creating felted scarves etc using wool or alpaca fibre and felting it onto silk. I've been learning the process in various forms, trying to get good enough to create some of the amazing kinds of art you can see here. I'm not quite there yet, but this weekend I worked on a large silk that I heavily felted with an actual intentional pattern. I'm not sure I like the heavier weight, but I certainly learned a lot in the process. There's a lot of rolling involved, and if nothing else my upper arms got quite a work out. Here are some photos of the work in progress. I'll be taking what I've learned on this project and applying it to the next - as soon as the ache in my upper arms goes away. Have you ever tried Nuno felting? Have you seen Nuno felted items in your travels? Comment and let me know.